Warm weather has returned to us at last, and it makes everyone want to get outside and soak in the sun. There are many benefits to getting outside for the elderly, including getting moving, enjoying a little sun, and breathing the fresh air. That being said, New Jersey summers can get pretty hot and humid. Dehydration, heat stroke, and sunburn are all risks that come to bear during the summer months. We’re still mid-spring at this point, but June is just around the corner, and the heat of July and August come right after. At Heritage Assisted Living, we have dedicated ourselves to helping the elderly live their best lives. Part of that is helping them be smart about their favorite activities. 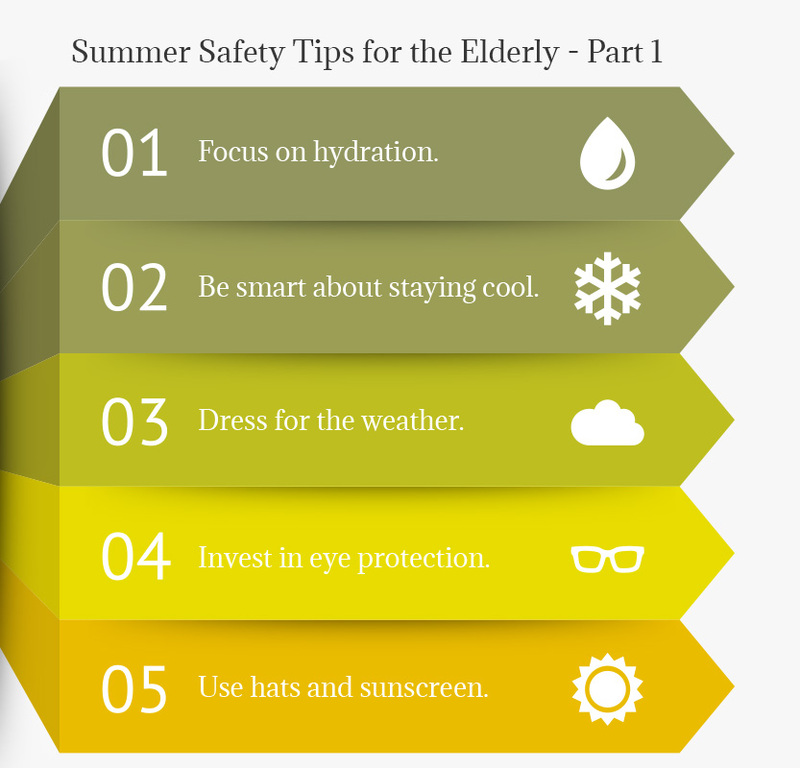 If you or your loved one can’t wait to get out into the sun, we have some valuable tips you can use to stay safe and healthy all summer long. You probably aren’t surprised we’re hitting this one right out of the gate. Everyone is vulnerable to dehydration in the summer, but the elderly are at higher risk. Why? Because the more our bodies age, the less ability they have to conserve water. The elderly also tend to become less aware of thirst and struggle to adjust to changes in temperature. It is easy to solve this issue by bringing water wherever you go and investing in products that replace the salt and potassium you lose when you sweat. Be smart about staying cool. If you’re dealing with a chronic medical condition, temperature increases can have very negative impacts. If you or your loved one doesn’t have regular access to air conditioning, malls or movie theaters can be wonderfully cool places to spend some time. They not only cool people down, they provide chances to get moving. 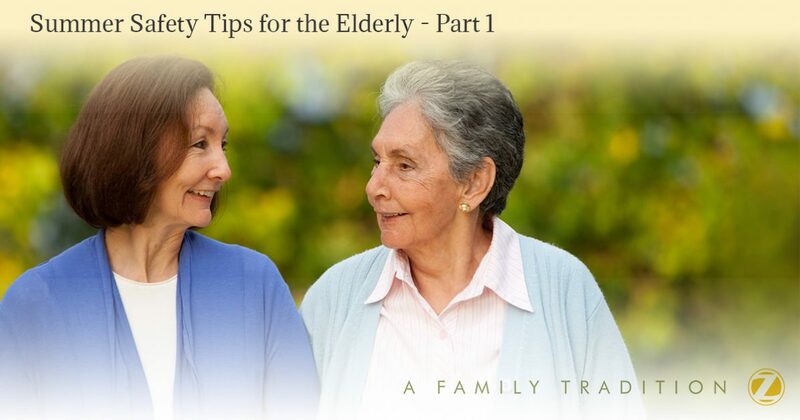 The last thing you want is for an elderly loved one to be stuck in an overly warm house. Our senior living apartments in New Jersey are all air conditioned so summer heat isn’t a concern. A huge part of comfort during summer comes from your clothing choices. Avoid tight clothes, synthetic fabrics, and dark colors. Instead, opt for cotton clothing that is loose and light-colored. The color will deflect more of the sun and prevent heat and sweat from being trapped against your skin. Nobody likes squinting all day, but sunlight can be particularly dangerous to seniors, who often suffer from vision loss anyway. Too much exposure to the sun can lead to irritated eyes and worse damage. Sunglasses are a fantastic solution. No matter how old you are, you should wear sunscreen when you’re out under the summer sun. Sun protection is especially urgent for the elderly, as their delicate skin burns faster and heat can affect them deeply. Keep sunscreen on and find a fun hat to protect ears, scalp, neck, and face. Our expert staff and welcoming community are eager to welcome you to the best summer of your life. Contact us in New Jersey today!